"It's not where you start in life, it's where you end up and what did you do along the way," said General Colin L. Powell, USA (Ret.) during the closing keynote address at the 2013 AIA Convention in Denver. "Did you invest in yourself? Did you educate yourself? Did you have expectations of yourself?" asked the retired four-star U.S. Army general as he shared leadership lessons from his remarkable 50-year military and diplomatic career.Powell was born in Harlem and was raised in the South Bronx by a father who never graduated from high school and a mother who, according to Powell, felt somewhat superior to her husband because she did. Both parents worked in the garment industry. Ethics and expectations were ingrained at an early age. "They were determined that the next generation do better," Powell said of his parents, who immigrated to the United States from Jamaica in search of economic opportunity. "The two things they put into our hearts and minds-'We have expectations of you to do better than we do, and expect you to take advantage of the education system. And don't do anything that would bring a sense of shame on the family. '"Powell, who served as national security advisor to President Ronald Reagan, chairman of the Joint Chiefs of Staff under presidents George H. W. Bush and Bill Clinton, and U.S. Secretary of State under President George W. Bush, holds the distinction of being the first African-American ever to serve in these posts. He began his military career in an Army ROTC program at the City College of New York (CCNY), where he graduated in 1958 with a B.S. in geology. Decades later, he dedicated the Colin L. Powell Center for Leadership and Service at his alma mater, with a mission to develop a new generation of publicly engaged leaders. "My professors of long ago would be rolling over in their graves," joked Powell, as he shared how one-third of CCNY's graduates are from a school named after him. He admitted to being an average student in most subjects, including a drafting class he dropped out of after two months. "It was in summer school, and I was taking a drafting class, and the professor said, 'Imagine a plane in space at an angle of 60 degrees being intersected by a cone, and draw the resulting figure,' and I said 'I am out of here.'" Powell found his true calling and excelled in the school's ROTC program. He received a commission as an Army second lieutenant upon graduation and served in the U.S. Army for 35 years, rising to the rank of four-star general. "No unimportant people in any organization"
"And what they drilled into me, and I've never forgotten since, is that the role of the leader is to put the followers in the best possible light. They're the ones that get it done. Your role is to put human beings entrusted to your care in the best possible environment to accomplish the job, to get the mission done. You need to be there, outwardly looking at the world and inwardly looking at your followers." During his talk to a near-capacity crowd, Powell drew upon leadership lessons he described in It Worked for Me: In Life and Leadership, his 2012 New York Times bestseller that he autographed after his talk. "What I drilled into all my subordinates over the years was [that] there are no unimportant people at any organization," Powell told the packed auditorium. "Everybody has value. Everybody is a human being. And you have to treat everybody in that way, and develop that bond of common purpose. When you treat them as a trusted follower, they will follow you anywhere." 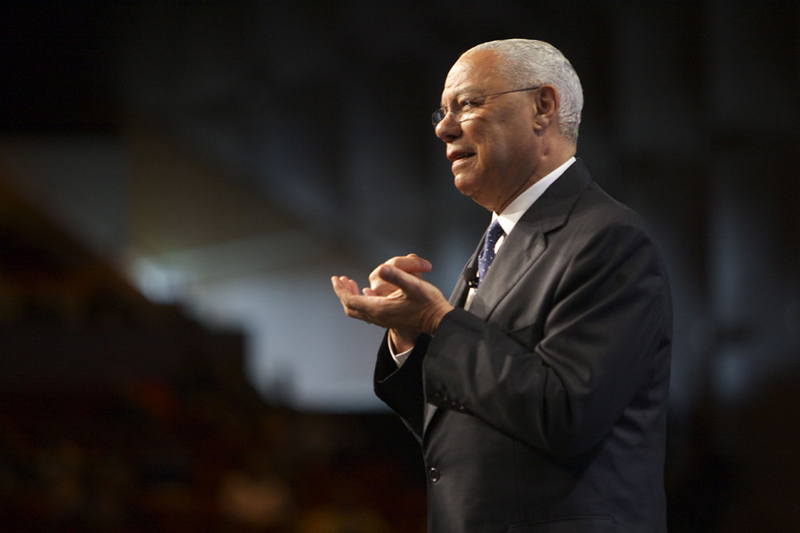 In a convention focused on leadership, Powell shared that leadership is about having a vision, hiring the best possible people to work for you, empowering them to get the job done, and leading with a strong human touch. "Leadership is a very human activity. You can't be a leader without human beings," he said. Powell also stressed the need to always look out for what's ahead. For a man who grew up in the era of only three television channels that all signed off for the day at 11 p.m. with the national anthem, Powell spoke of how the world is so much more interconnected now. "People are talking to each other on the Internet. You can't hide anything anymore. You need to understand the nature of this complex world where everybody is connected. I was born in an analog age, but [am] trying to keep up digitally," Powell said. A former member of the board of AOL, Powell is now a strategic advisor at Kleiner Perkins Caufield & Byers, the renowned Silicon Valley venture capital firm that helped launch Google, Amazon, and other technology startups. Yet the basic lessons from his Army days still hold true: "Followers are looking for leaders who have physical and moral courage," Powell said. "Followers are looking for leaders who have integrity. Followers are looking for leaders who are selfless, always focusing on the purpose of the organization and taking care of the troops that can get it done. That's what leadership is all about."